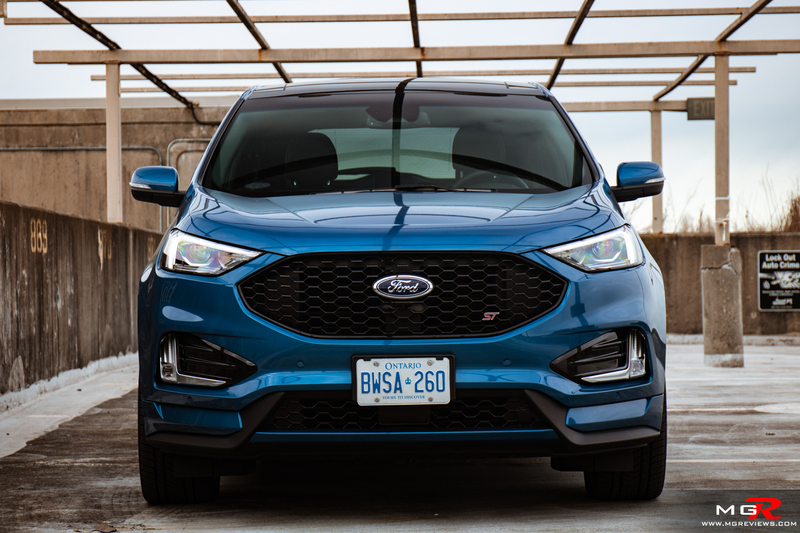 Can an SUV be a sports car? Common sense would say no but Porsche threw that out the window when they introduced the Cayenne. Now nearly all of the top brands have a sporty SUV such as the BMW X5M, Mercedes GLC 63 AMG, and even Lamborghini with the Urus. 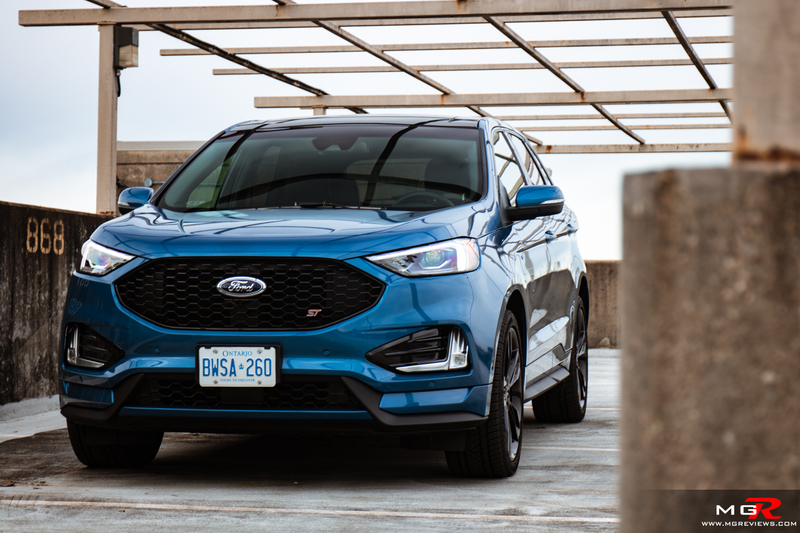 So Ford thought that they should jump on the bandwagon by sprucing up their Edge SUV and turning it into the Ford Edge ST.
Engine – The 2.7L EcoBoost twin-turbocharged V6 engine that’s under the hood produces 335 hp and 380 lb-ft of torque. Those are Ford’s specifications when tested with 93 octane fuel. However most gas stations don’t carry 93 octane fuel, at least not here in Canada so it has me wondering if the actual figures are a bit lower. Regardless, it still feels pretty fast for something this heavy and this big. 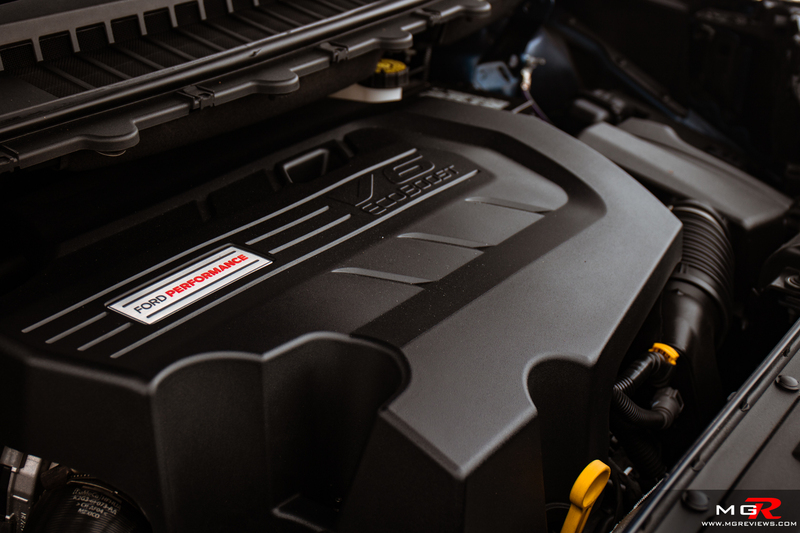 The turbo threshold is a bit on the high side so when you put your foot down at around 1,500 rpms, it takes a bit until you feel that surge of power. 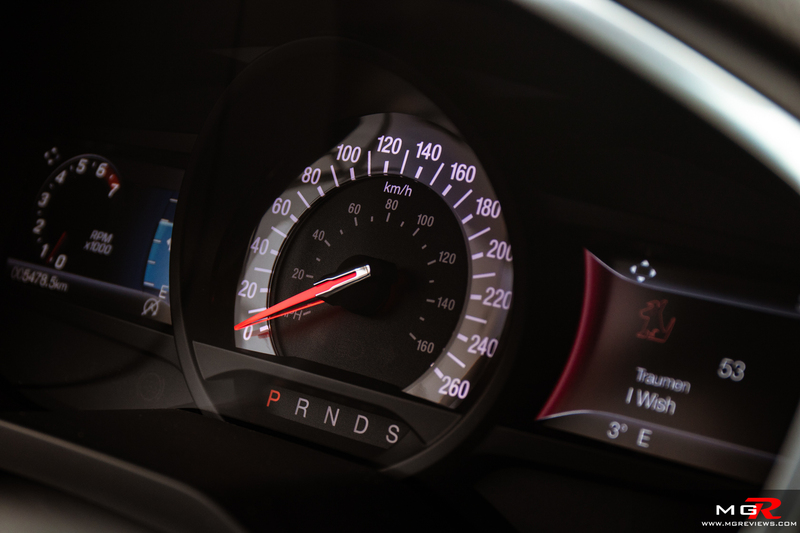 Put your foot down when the engine is spinning at around 3,000 rpms, and the surge of power is almost immediate. Despite being such a powerful engine, is decently economical. 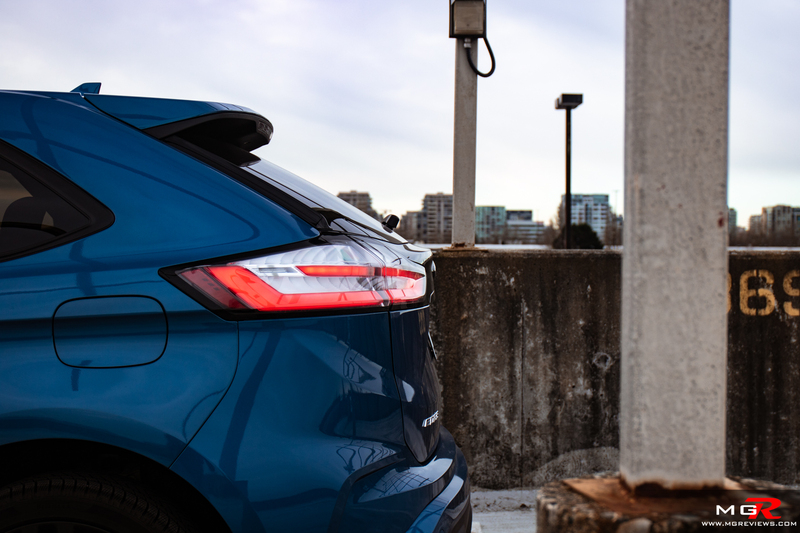 Ford claims it will achieve 9.2 L/100km (25.6 mpg) on a highway and 12.6 L/100km (18.7 mpg) in a city. During my time with it, I averaged around 11.7 L/100km (20.1 mpg) over 600-ish km. 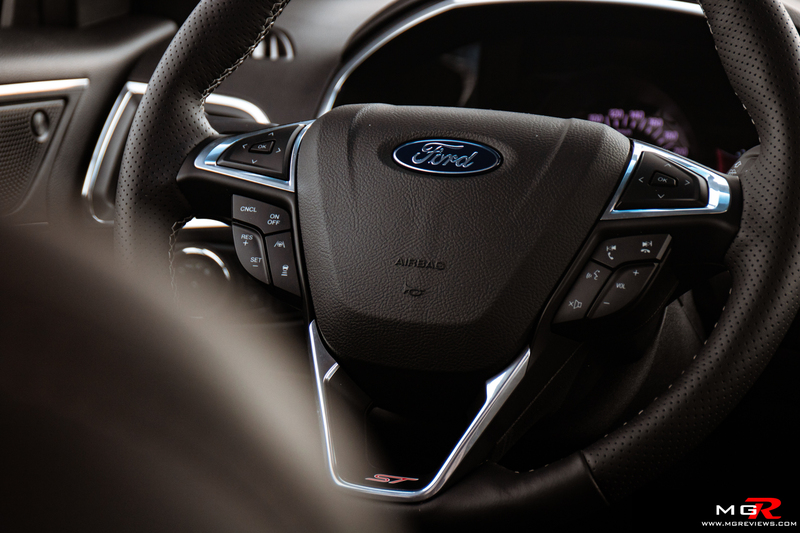 Transmission – An 8-speed automatic is the only transmission that is available with the Edge ST. Unfortunately this is that part of the Edge ST that really lets it down. 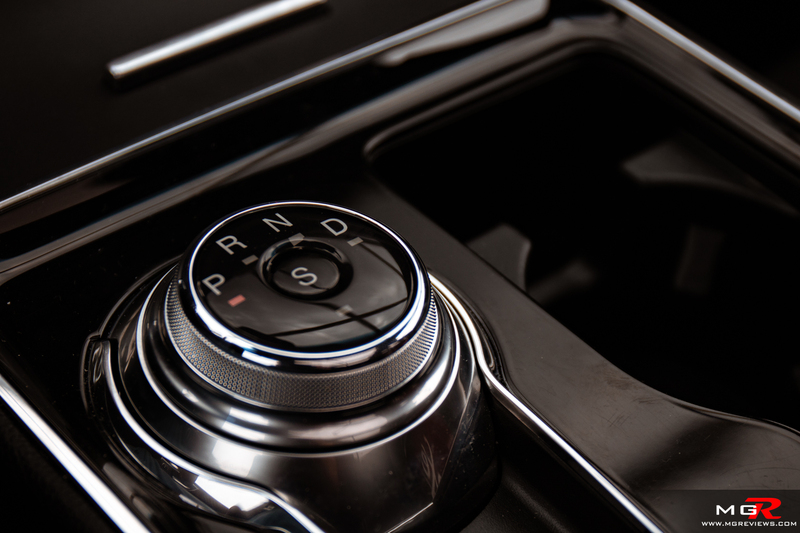 Unless the transmission is completely warmed up, it is slow to shift gears and each gear change feels like it’s done by someone who’s just learning to drive a manual transmission. 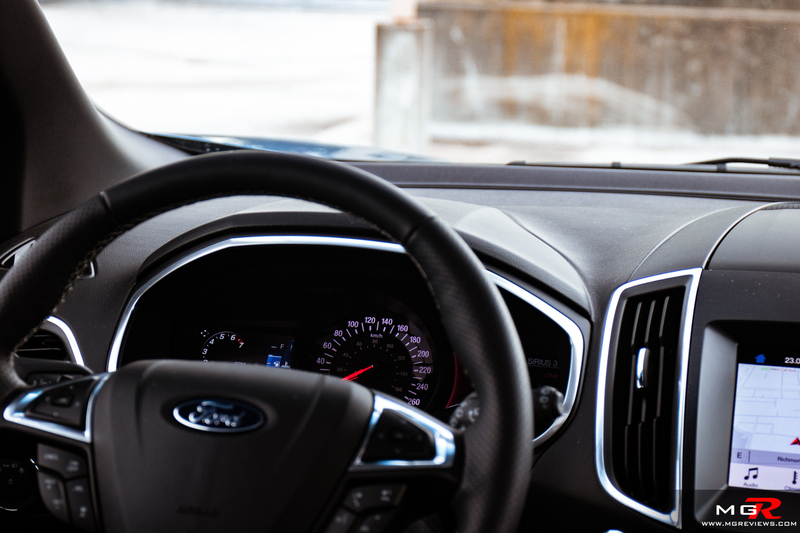 The paddle shifters don’t help much either when it’s warming up. 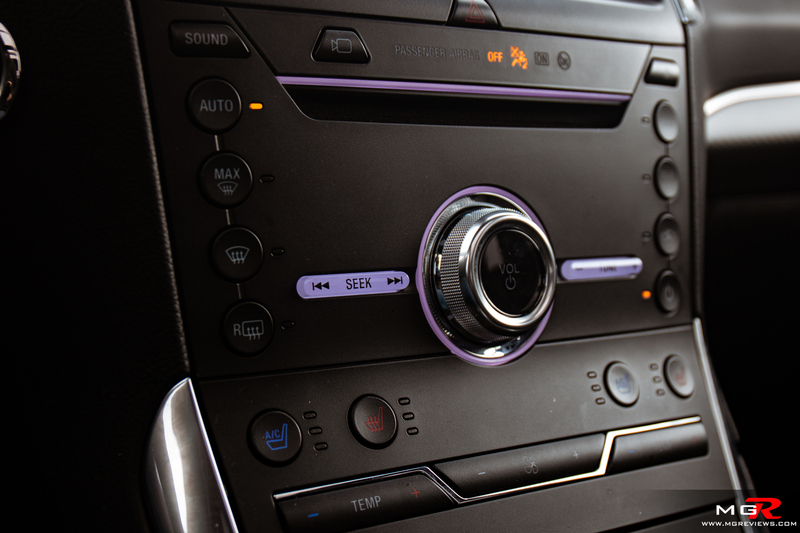 Having said that, it is more tolerable once all of the components inside the transmission are up to temperature. 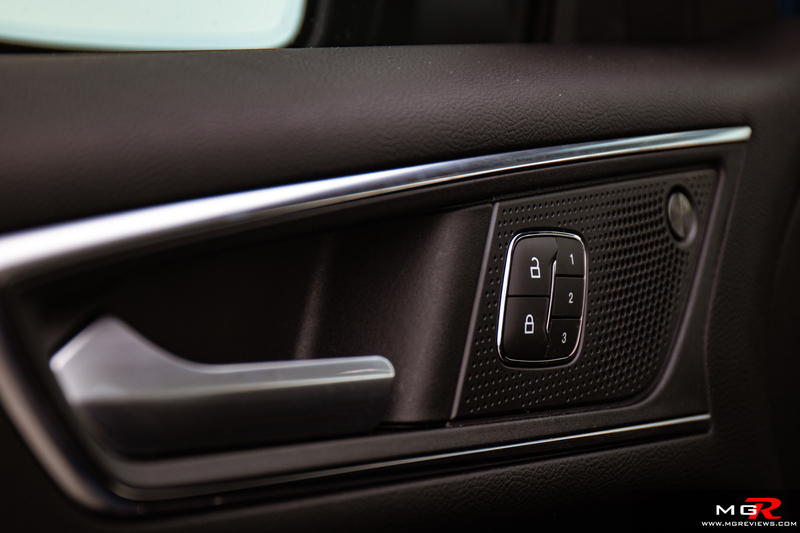 In normal D mode, shifts are more quick and smooth while in S mode, the shift points change to better utilize the turbo engine’s power. 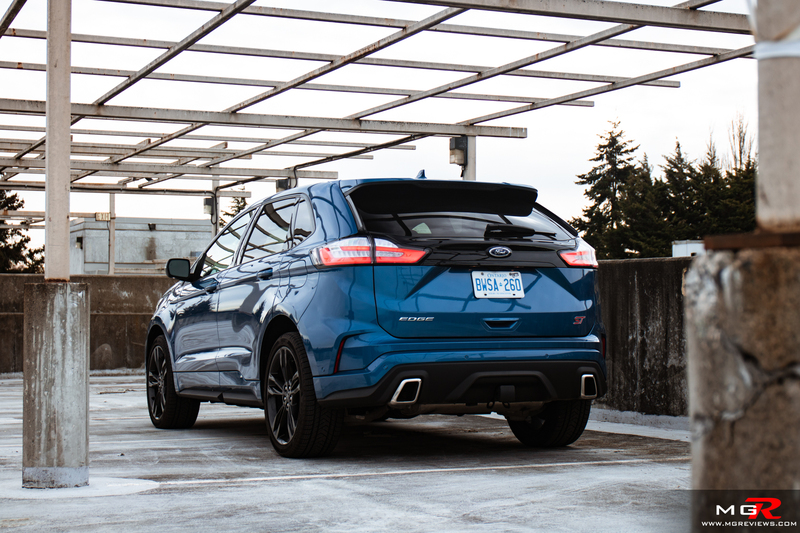 Braking – The Ford Edge ST doesn’t get multi-piston brake calipers with a bright red paint job. It uses simple floating piston calipers with normal discs. The result is cheap to replace once they wear out but it still provides a strong braking force to stop the big SUV. 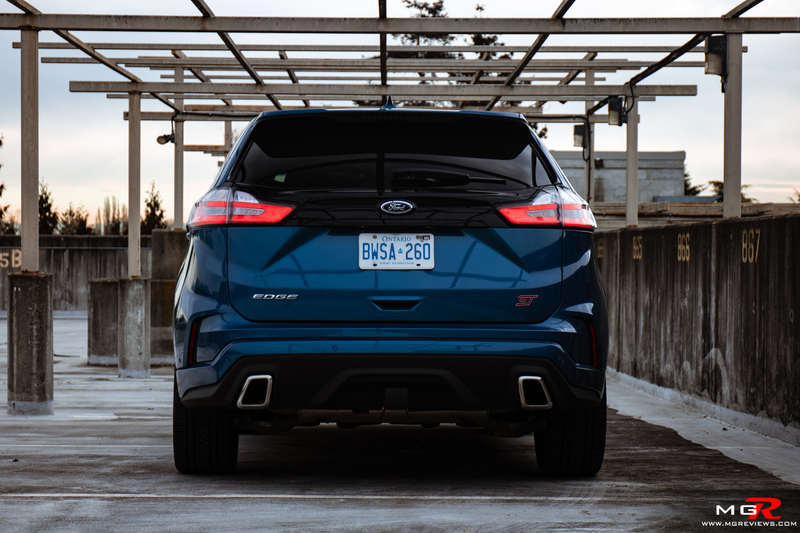 Handling – Just like the brakes, the Edge ST doesn’t get any fancy suspension setup. It’s just regular independent suspension on all four corners with regular shock absorbers. So does that mean it’ll tip over at the first sight of a corner? No, it’s actually pretty good around corners. There is understeer at the limit especially with the snow tires that are fitted to this demo vehicle, but around twisty mountain roads, it feels planted. 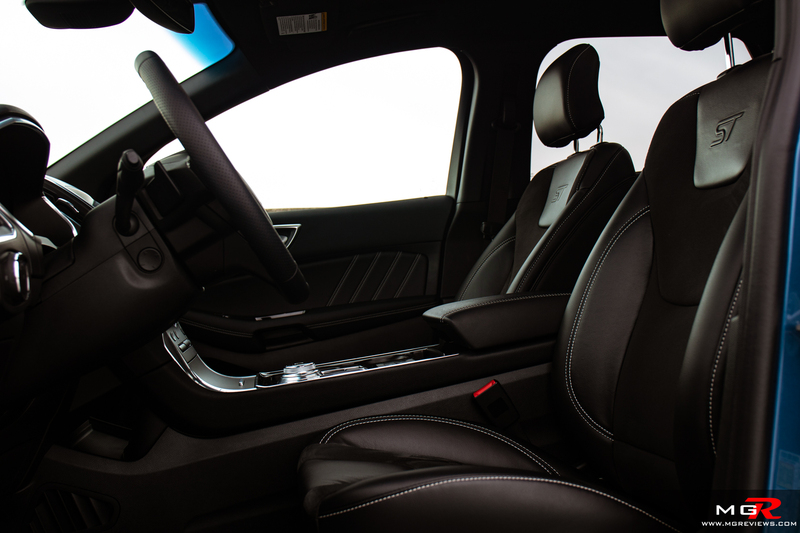 Ride Comfort – For a sporty oriented SUV it’s actually quite comfortable on a day to day use. It feels just right when driving over a pothole or on badly cracked city streets. 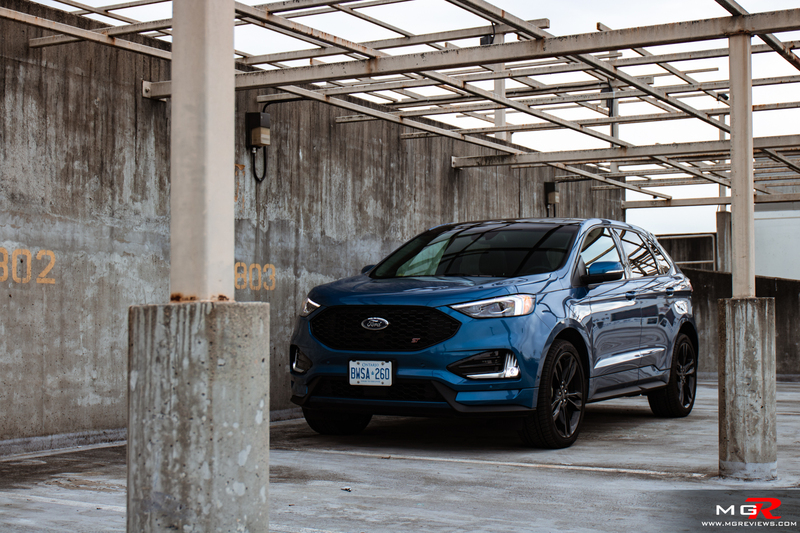 Compared to the normal Edge Titanium, the suspension does feel slightly stiffer but it’s not going to hurt your back over long trips. 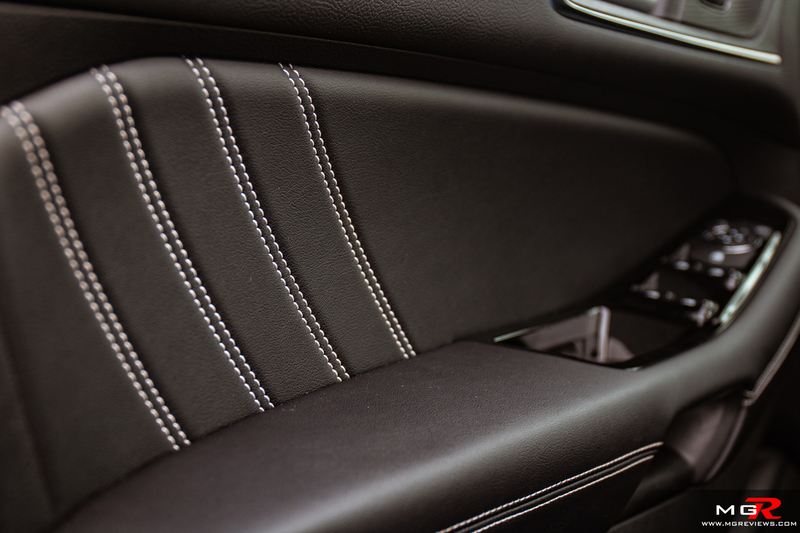 One thing to mention though are the front seats are bolstered in the wrong place. The side bolsters are bigger than those in the normal Edge but the bolsters by your thighs are too thick. It can be annoying to some. 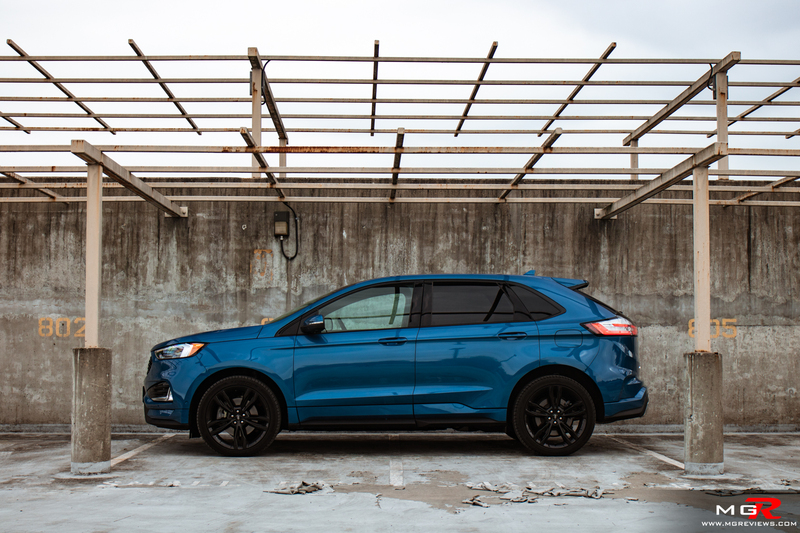 Interior Space – The 2019 Ford Edge ST feels big behind the wheel and the same goes for the interior. 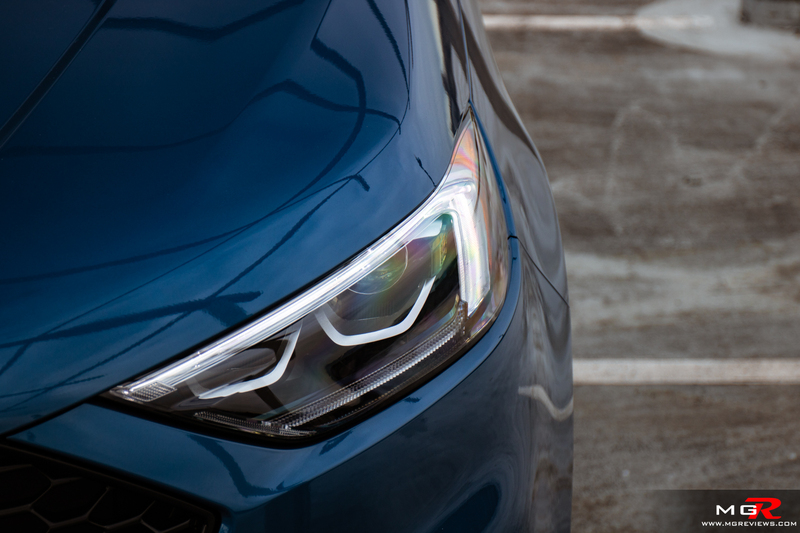 There is a lot of room for the front occupants and you sit high up making for good front and side visibility. 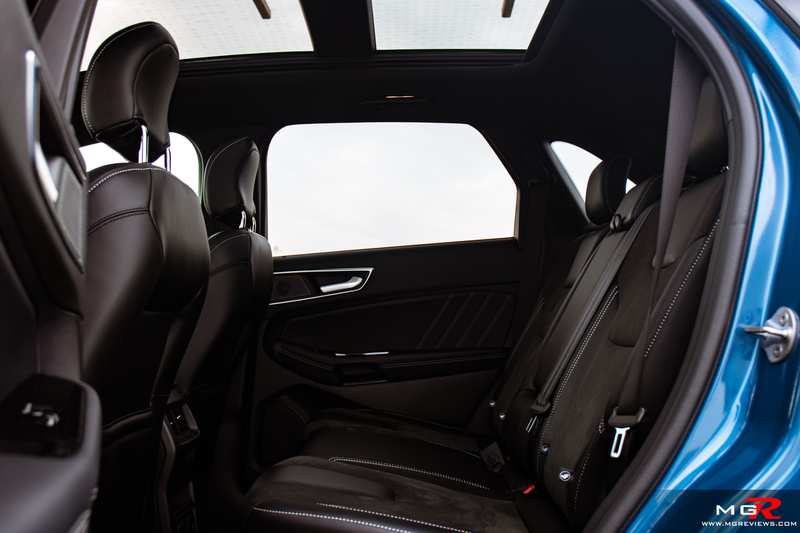 Rear occupants have a good amount of space and the trunk is very large for this class of SUV. 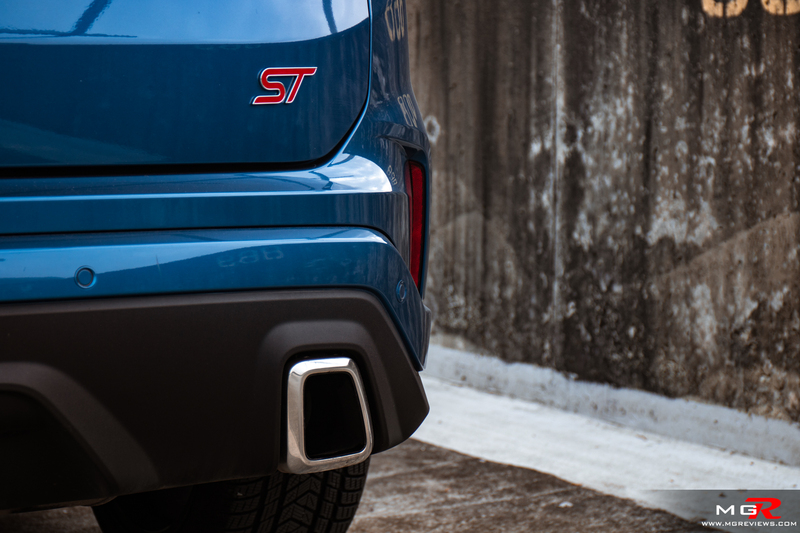 Noise, Vibration, & Harshness – Under normal driving conditions, the Edge ST is just as quiet as the normal Edge. However, put the ST in S mode, and there is a very noticeable change in the exhaust tone. Sadly the noise is not coming from the back exhaust tips but rather the speakers inside the cabin. 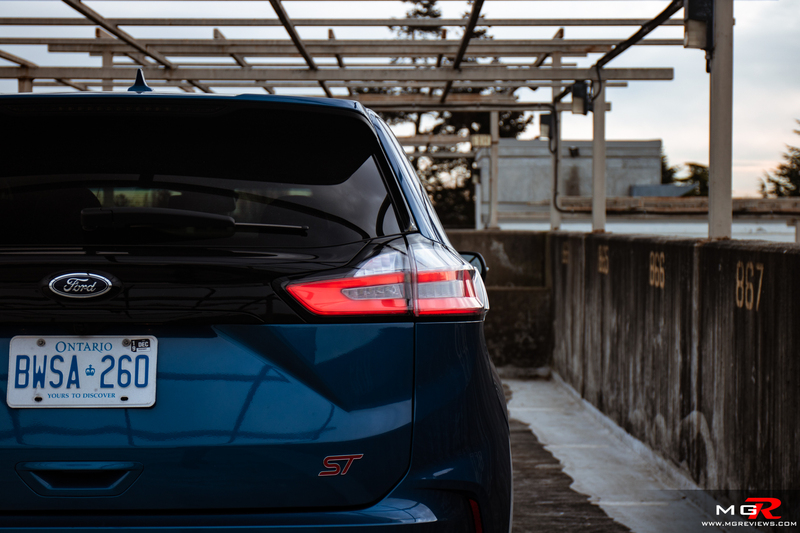 Overall though the Edge ST is a quiet SUV. 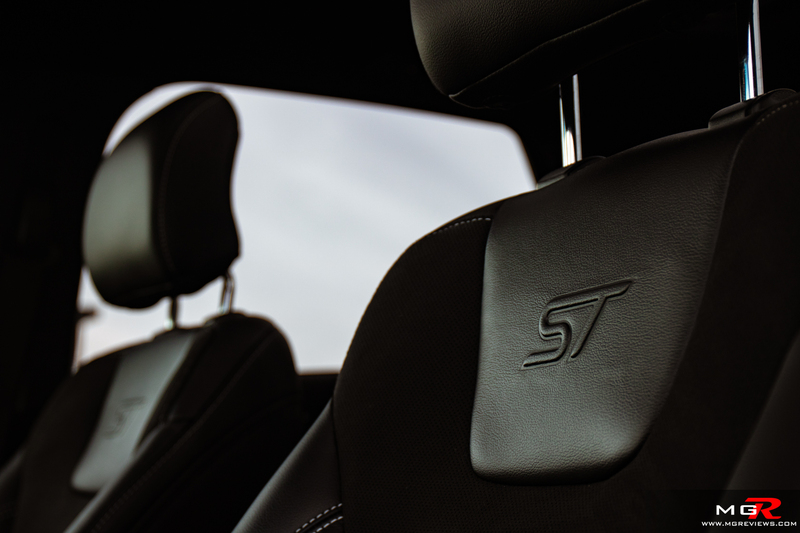 Interior Design – The interior of the ST is pretty much identical to that of the Edge Titanium. 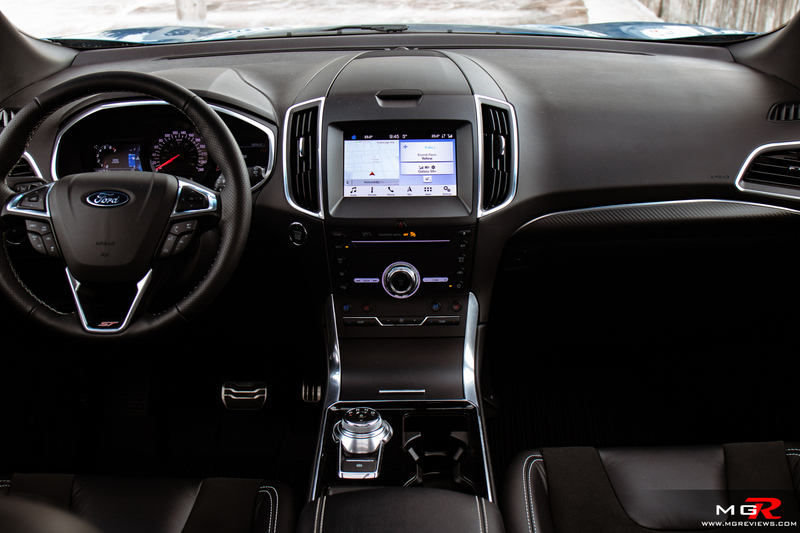 The biggest difference though are the sporty seats and a bit of carbon fiber trim along the dashboard. Other than that, everything else is the same and all the controls are well laid out and easy to use. 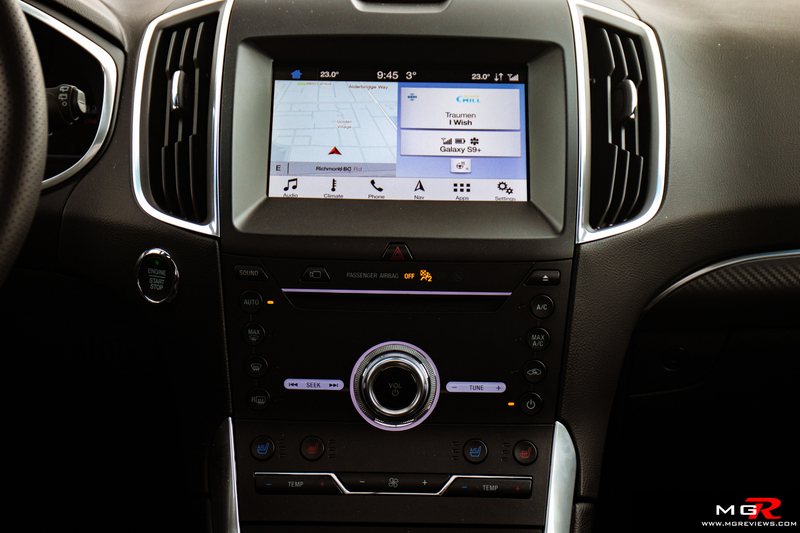 Gadgets – This being the top trim of the Ford Edge, it has every option available. 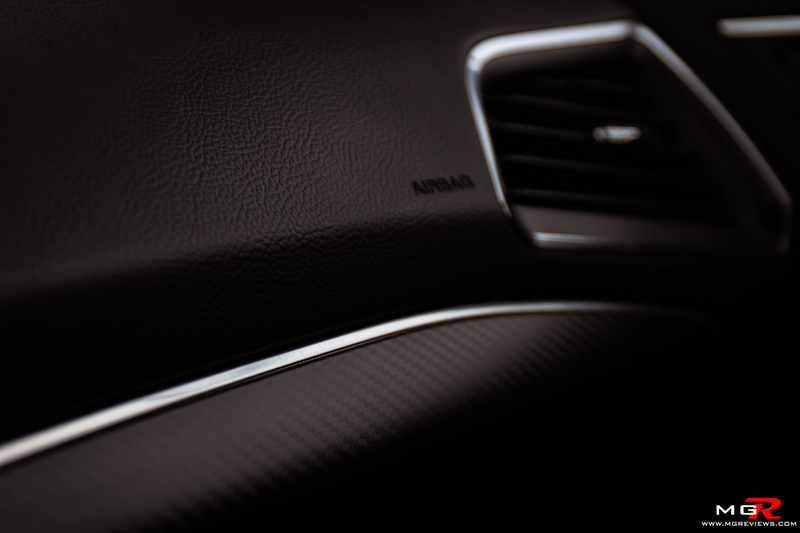 Granted, a good portion of the features are part of a $5,800 CAD package. 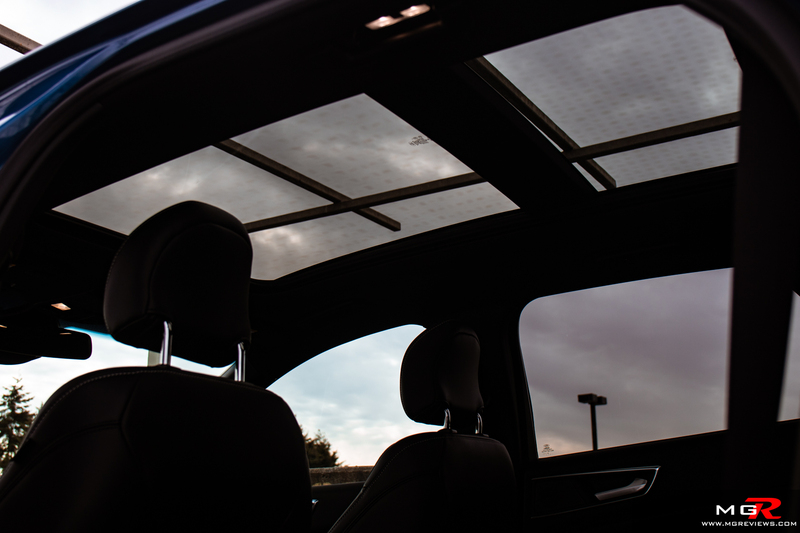 Things like navigation, panoramic sunroof, ventilated front seats, adaptive cruise control, and so on are part of this package. 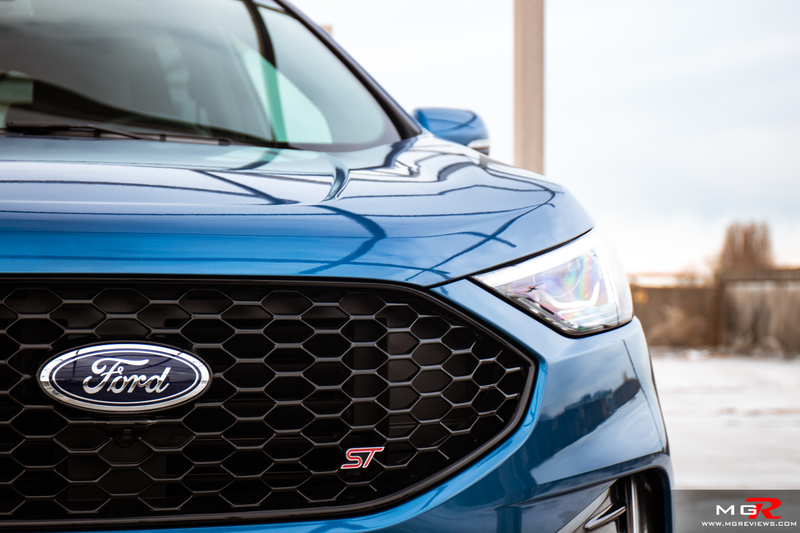 The standard ST starts at $47,699 CAD and can be loaded up to $59,049 CAD. Quite a lot of money for what’s considered a non-luxury brand. 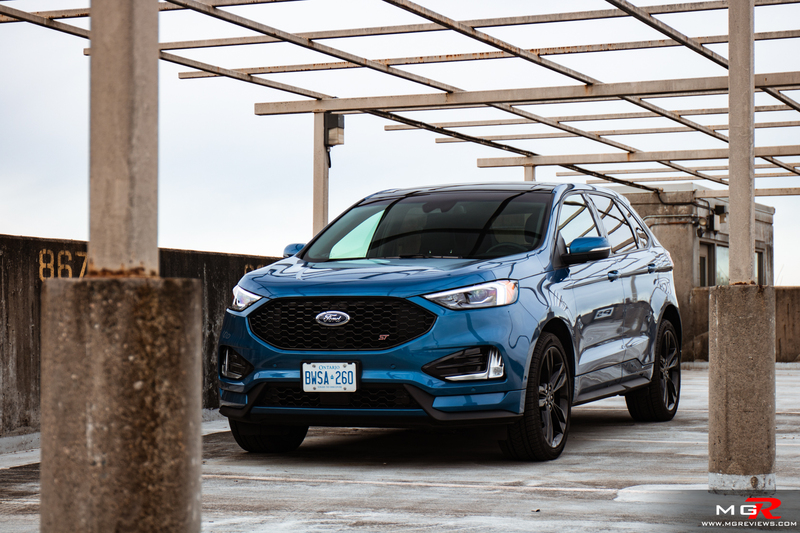 Exterior Design – Ford added a few sporty touches to the exterior of the Edge ST such as the unique exhaust tips and unique ST grille. 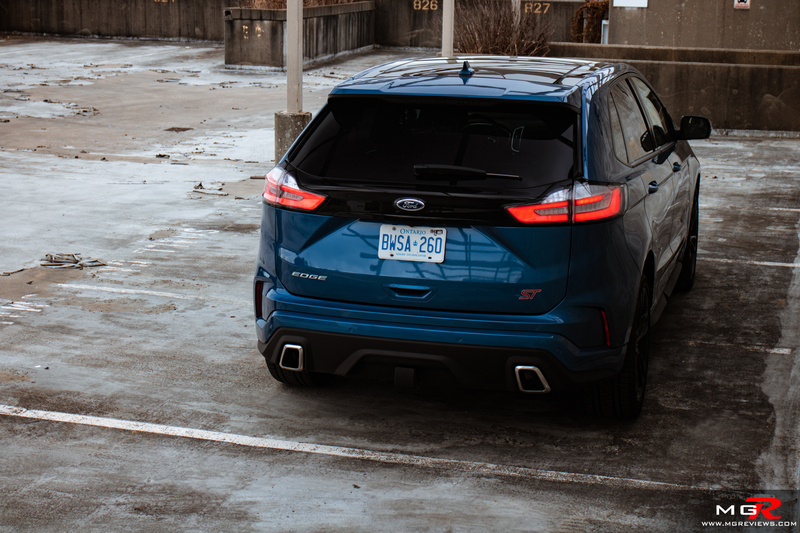 I do like the fact that the rear light bar is gone that was present on the old 2017 Ford Edge. 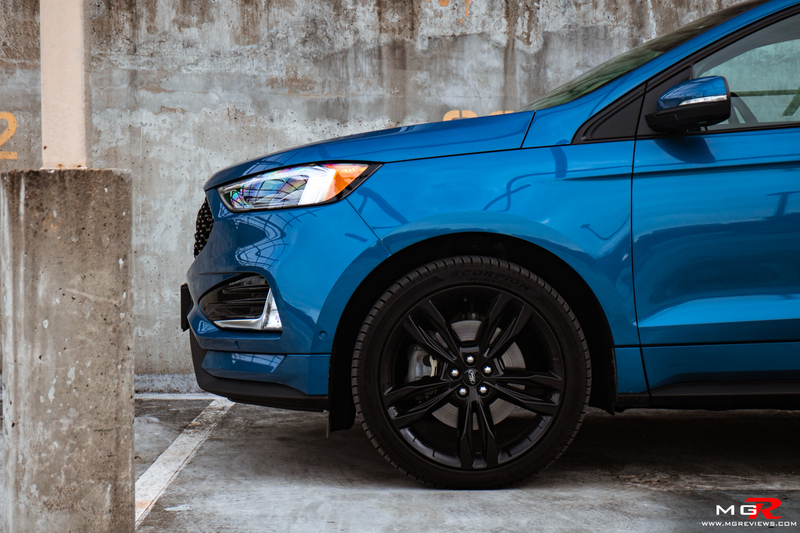 Overall it looks like a sporty SUV especially in this Ford Performance Blue paint. But looking like a sporty SUV and driving like one are two different things. If Ford puts a better transmission or reprograms this one to be faster and smoother, it would definitely be worthy of the sporty ST badge. 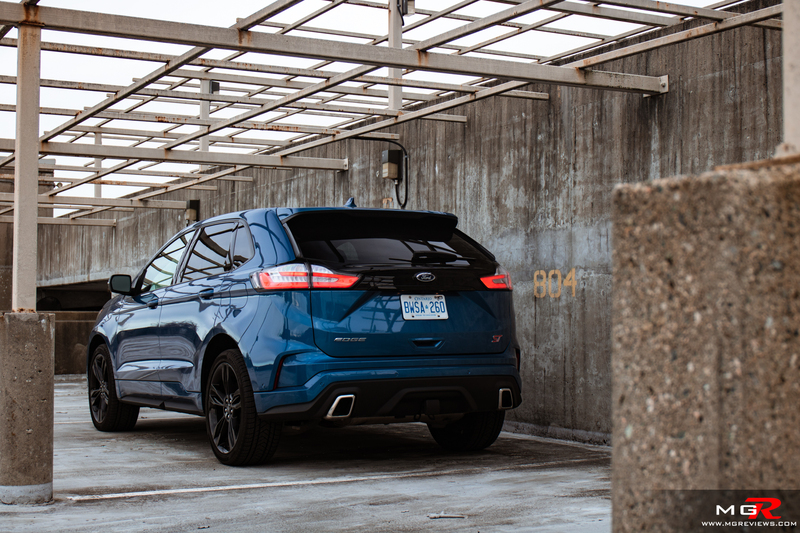 But for now, it’s really hard to recommend it over a normal, similarly equipped Ford Edge.